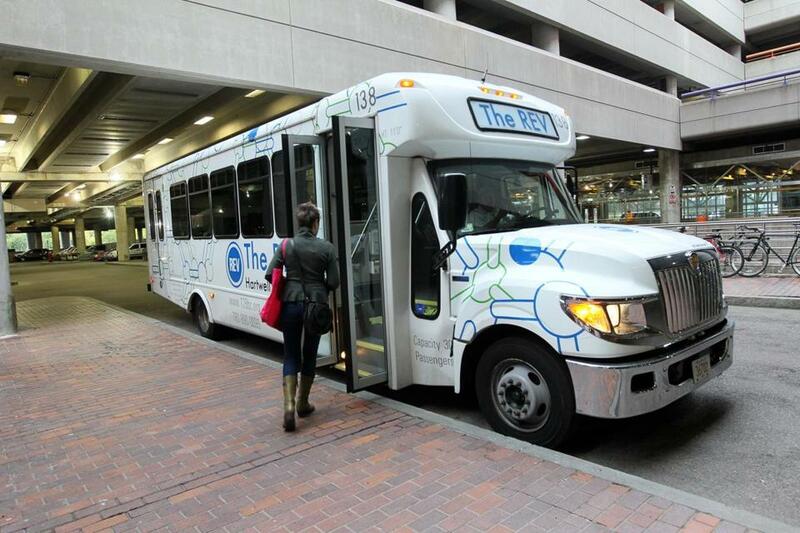 Biotech companies and the town of Lexington split the cost for shuttle buses that carry workers from Alewife Station to biotech research parks. When most people think of Lexington, their first image isn’t a research laboratory. The Minuteman statue would be a good bet. Or maybe the Lexington Common, where the first shots of the Revolution were fired. Possibly, the historic homes that date back to the 18th century. But that image is getting modernized. Over the past few years, Lexington has become home to some two dozen life sciences companies as the town pitches itself as Greater Boston’s newest biotech cluster. With commercial rents well below those in Cambridge and Boston, and easy access to Routes 2 and 128, Lexington is attracting midstage biotech firms for some of the same reasons that young couples leave the city for the suburbs. 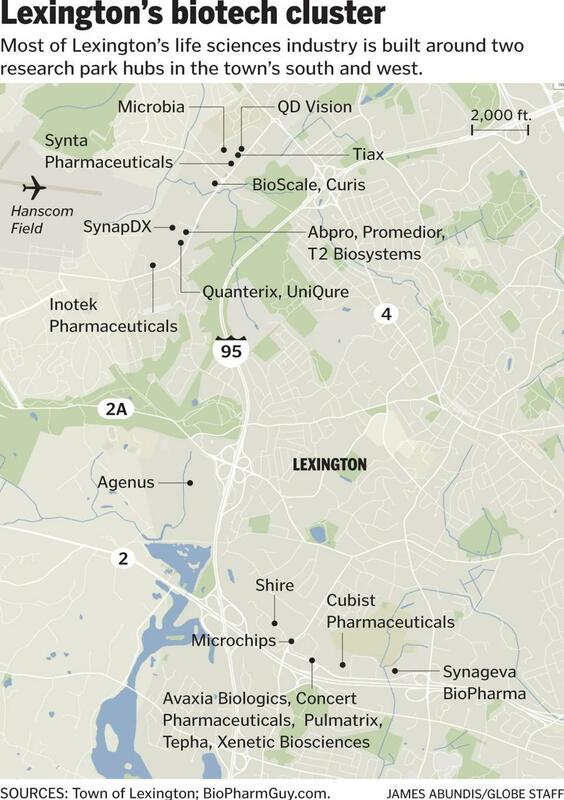 Most of the growth in Lexington’s life sciences industry has taken place in two research park hubs. Several companies are based on and around Hayden Avenue, just north of Route 2. That area is anchored by the Irish biopharmaceutical company Shire PLC and Cubist Pharmaceuticals, which specializes in antibiotics. Combined, Shire and Cubist employ 2,350 people in Lexington. More recently, midsize biotech companies have flocked to Hartwell Avenue, near Hanscom Air Force Base and the town’s border with Bedford, reinvigorating a flagging commercial district. Companies have come from as close as Cambridge, and from as far away as Europe, such as a Dutch company. Thomas Ragno, a principal at King Street Properties, a Cambridge commercial real estate firm, said his company bought its first building on Hartwell Avenue in 2010, and acquired the two adjacent buildings in 2011. Today, nine biotech firms have labs and offices in the buildings, which Ragno refers to as “Kendall Square West.” The buildings are nearly full, and King Street has plans to build a fourth building next door to take advantage of the area’s growing desirability. “When we started, we were getting about $30 a square foot. We’re now getting solidly $35,” said Ragno. Even with the uptick in rents, companies can still find space at about half the price of Cambridge or Boston, which can cost as much as $70 per square foot. Garo Armen, chief executive of Agenus Inc., said the town offers better amenities, such as more restaurants and a nicer hotel nearby, than it did in 2004, when his company signed a 30-year lease there. His company, which makes therapeutic vaccines, moved to Lexington after locations in Woburn and Framingham didn’t work out. “Lexington is a much more quaint, prettier, safer town,” said Armen. He added that its proximity to Cambridge also makes it easy for employees to go there for meetings. About 3,400 people work at two dozen biotech companies in Lexington, accounting for about one in six jobs in the town. Many others work in related life sciences roles, doing contracted lab work and diagnostic services. M. Scott Maguire, the chief executive of the orphan drug company Xenetic, said his company’s move to Lexington from London brought it closer to its suppliers. Xenetic’s chairman, he noted, runs a different biotech company in the same building. Still, biotech executives admit they were initially worried that moving to Lexington would hurt their ability to draw talent from Cambridge, about a half-hour away on Route 2. But Bill Ciambrone, the executive vice president of technical operations at Shire, said the opposite happened after Shire moved to Lexington from Cambridge in 2010. It has made commutes from more far-flung suburbs more reasonable, said Ciambrone, and it made it easier to recruit mid- and late-career professionals, who tend to live in the suburbs. The town and the owners of the biotech research parks share funding for a program to make the biotech sites more accessible to those without cars. Two shuttles, costing as little as $1, carry riders from Alewife Station to commercial districts on Hayden and Hartwell. The Hartwell shuttle, which has run for a year, provided nearly 1,000 rides in August, according to Patrick Sullivan, the policy director of the 128 Business Council, the nonprofit that operates the shuttles. Ridership on the more-established Hayden route has risen 84 percent from 2009 to 2013, to 5,000 rides per month, as companies along that route have hired more workers. “Even with three vehicles, we sometimes have to dispatch a fourth bus to meet demand at peak times,” Sullivan said. Town officials have worked to woo even more biotechs. The economic development office has published brochures that tout a platinum “BioReady” rating from the Massachusetts Biotechnology Council, the industry trade group. The rating indicates a hassle-free permitting process for lab renovations or new construction. And should employees consider moving there, the brochures note that Lexington also has miles of nature trails and top-notch schools. Correction: Due to reporter errors, an earlier version of this story had the incorrect name for Hayden Ave., and the ridership growth on the shuttle bus to that area was incorrect. It grew 84 percent from 2009 to 2013. Additionally, a ridership statistic for the Hartwell shuttle was incorrect. The shuttle provided nearly 1,000 rides in August.